Tavern serving craft beer & cocktail and locally sourced American style dishes. Upscale gastropub offering updated versions of all of your favorites from chef Ivan Hernandez. gastropub serving elevated bar food paired with craft cocktails and a smart wine list. 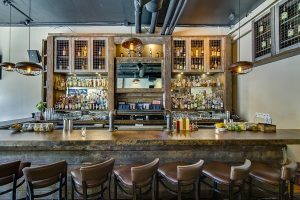 Cocktail lounge & gastropub for booze lovers & audiophiles. Brooklyn-themed gastropub featuring some of the best of the borough’s local producers into their menu of local fare, cocktails, & taps. Sports gastropub serving American/ Euro pub fare, and featuring over 75 selections of beer, and a wood fire burning pizza oven. Underground cocktail bar below Bleecker Kitchen & Co.
Gastropub serving contemporary Israeli cuisine and original craft cocktails. Classic American and English comfort food and a late night menu. Irish pub & whiskey library. Bar, restaurant, beer consultancy, and retail store under one roof. Equestrian-chic restaurant featuring ‘grilled meats & aquatic delights’ by Michelin-starred Chef Brad Farmerie. U.K.-inspired eatery and modern gin joint featuring beverage program designed by world-class bartender Dominic Venegas. Gastropub serving pub grub, cocktails, and craft beers. Craft beer bar & kitchen. 19th century townhouse converted to a three story bar & restaurant including a rooftop beer garden. Irish gastropub named for the translation of the Dutch version of Gramercy. Quality food, craft beer and cocktails. Upscale sports bar serving fusion of classical American fare w/exotic ingredients. Classic NY cocktail destination in the cellar space below the Chelsea Market. Tri-level restaurant, bar, and event space serving upscale American cuisine, including a second, gluten-free kitchen. Sports pub serving steaks, burgers, seafood and craft cocktails. Irish gastropub with 34 beers on draft. An homage to classic and beautiful historic inns and taverns of America. Gastro bar, restaurant & lounge featuring 45 draft beers on tap. Neighborhood craft beer & cocktail bar serving upscale American comfort food. Brooklyn off-shoot of the Lower East Side’s Welcome to the Johnson’s. Cozy bar serving rotating local draft beer, classic cocktails, and specialty sandwiches. Chill neighborhood bar serving modern pub fare. Gastropub with an upscale modern American menu. Neighborhood bar & grill serving comfort food. neighborhood gastropub with 30 New York State craft beers on tap. Did you eat yet? Attempting to re-invent the term “Bar food” . Local Astoria bar and eatery, placing an emphasis on all things fresh and local. Irish whiskey bar featuring modern Irish cuisine. Welsh gastropub serving authentic food, craft beer and outstanding whiskey. Gastropub from the owners of Wilfie & Nell. Gastropub with craft beer & cocktails. Serving craft beer, artisinal cocktails and gourmet food. Gastropub in the Dutch Kills area of L.I.C. Gastropub with a vintage 1900s vibe. Sports tavern featuring a wood-fired pizza oven. Gastropub & biergarten featuring a contemporary twist to traditional German & Austrian cuisine. Like most of New York City, this page is under perpetual construction. We will do our best to keep this page accurate. Please feel free to add additions or corrections in the comments section below.